Winter hardy to USDA Zones 7-10 where it may be grown in fertile, medium moisture, well-drained soils in full sun to part shade. Plants tolerate a wide range of soils except poorly-drained ones. Plants may not flower well in too much shade. Remove flowering stalks after bloom. Plants are evergreen in warm winter locations, but leaves will show considerable damage in colder winters near the northern edge of the growing range. Plants can spread invasively by creeping rootstocks, particularly in loose soils. Unwanted spread can be addressed by root barriers. 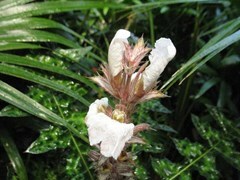 Plants generally spread less in the northern parts of their growing range. Plants are best propagated from root cuttings taken in early spring, but may be grown from seed. Plants can be slow to establish in the garden (particularly if started from seed), but become somewhat difficult to eradicate once established since small sections of root left behind can sprout new plants. This plant is not reliably winter hardy to the St. Louis area. If attempted outdoors in St. Louis, it should be sited in a protected location and mulched. Acanthus montanus commonly called mountain thistle is a shrubby, spreading perennial that is grown as much for its attractive foliage as for its architecturally bold flower spikes. This species is a sprawling forest understory plant that is native to tropical western Africa. Deeply lobed, ovate to lanceolate, spiny, dark green leaves (to 12" long) with acuminate tips and silvering are both showy and ornamental. Two-lipped, snapdragon-like, pink to rose flowers bloom in summer on upright flower spikes (to 10" long) which rise from the branch ends. Plants grow to 4-6' tall when in flower. Genus name comes from the Greek word akantha meaning spine in reference to the toothed edges on leaves in some species. No serious insect or disease problems. Snails and slugs are occasional visitors that can do substantial damage if left unchecked. Where winter hardy, plants can spread invasively in optimum conditions. Where winter hardy, this is a bold, stately plant that may be grown as a specimen but is perhaps best sited in small groupings. Naturalize on slopes. Plants are not winter hardy to the St. Louis area where they should be grown in greenhouses, conservatories or as houseplants.